The all-electric Nissan LEAF requires no gasoline and now, if you're buying in Texas, you also get free public charging through eVgo stations in the state as well. Free from not just gasoline, but all fuel costs? How cool is that for Plug-In Day! Nissan and NRG eVgo have teamed up to give Texas buyers and lessees of the all-electric Nissan LEAF unlimited access to eVgo charging stations for a full year. This means that if you get your new LEAF in the Dallas-Fort Worth or Houston areas, where eVgo stations are located, you can charge at any of those charging stations for free. Anytime. No limits. The eVgo Freedom Station networks includes 23 locations in the Dallas-Fort Worth areas and 17 in the Houston area. This includes Park N' Fly locations at both the DFW and IAH airports. 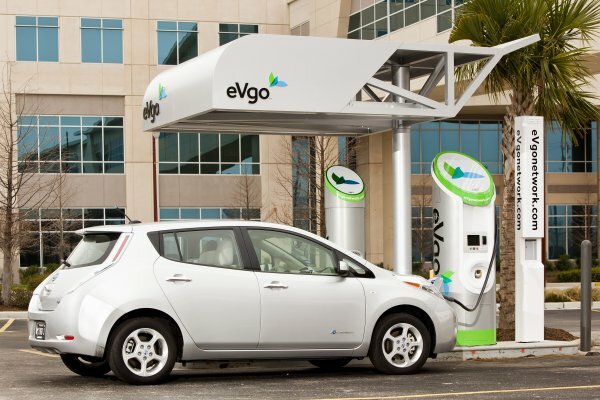 "Nissan LEAF owners who already subscribe to NRG eVgo's Freedom Station network rave about the convenience and increased range confidence it provides," said Erik Gottfried, Nissan's director of EV Sales and Marketing. "Adding one of the country's most innovative charging plans to the world's best-selling electric car is a clear win for Nissan LEAF buyers." In the Dallas-Fort Worth area alone, sales year-on-year for the LEAF have jumped 500 percent so far this year. Nissan credits both larger local interest in the car and the fast growth of a strong public charging infrastructure in the metro area. Word-of-mouth referrals from current owners has also marketed the Nissan LEAF effectively as owners tout the car's efficiency and practicality. This weekend's National Plug-In Day events in both metro areas will also bolster awareness for the plug-in LEAF. The eVgo network includes stations that are capable of Level 2 charging as well as DC fast charging. Charge rates at Level 2 average between 12 and 25 miles per charge hour while fast chargers can deliver an 80 percent charge in under thirty minutes. Nissan will offer "No Charge to Charge" with acquisitions of the Nissan LEAF made between October 1, 2013 and March 31, 2014 at all certified Nissan LEAF dealers in the Dallas-Fort Worth and greater Houston area markets.